Watch Alan Fletcher talking about The Art of Looking Sideways in the Phaidon book trailer. This book is actually, in a way, a design scrapbook itself. 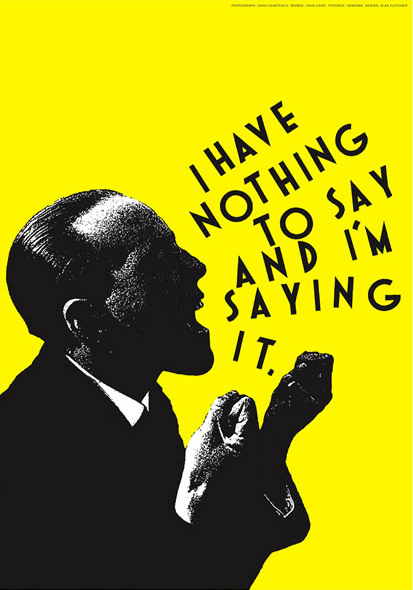 Not specifically about books, but about all the interesting, esoteric, pretty, witty and mind-boggling things to do with the interplay between verbal and visual collected by its author, alan fletcher, during his long career in design. When it comes to design, it’s all about play. You can tell that right from the cover (which, might I add, is a lovely example of typography – look at that ragged edge!). It’s really hard to show the design of this book without actually seeing it in real life, but suffice to say there’s no real uniformity to it. There are pages of quotes, pages of writing in varied layout, full-page images … And I think it all works. It’s the kind of book you can flick open at random and know you’ll find something awesome and intriguing. The ‘chapters’ (if you can call them that) are all introduced by a plain black page with a small quote stretching across the middle of it. All the pages play with the relationship between typography and image and the way that we read both things. The spread with the cardboard box is a good example of this: the type goes in varying directions depending on what it’s indicating that you (or your eye) should do. Normally I’d steer away from fiddling around with type too much (I think I’m definitely of the leaning that typography is something you should appreciate without even being aware of it, the crystal goblet and all that) but I think that the nature of this book as a scrapbook of sorts allows more play than other books might.